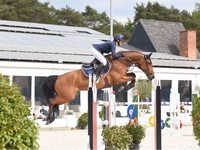 Kathi had a good weekend at the CSI2* show in Lier, Belgium. Amarit d'Amour was placed 5th in the opening Grand Prix qualifier after a clear, fast round while Etna placed 4th twice in the 1.40m classes. Chaning Tatum also did a good job, and jumped clear in all his classes. The next stop for Kathi and her horses will be the Brussels Stephex Masters.